Generally, when users land your Website they are expecting to get some outcome or results. If you’re searching for something on the search and you land on a 404 Error page through the search results. You expected to see the item/information that your searched for but instead you land on an Error page, wouldn’t it be helpful of the Error page could guide you in the right direction to find what you initially expected to see. Unfortunately when browsing the internet not everything is perfect and at times, it happens that a customer lands on an error page. The most common one of them all is the 404 error page. The single biggest issue is the fact that website owners don’t know how to make the most out of the 404 error page. It’s common to see 404 Error pages which has no branding, no links and no calls to actions. This is actually terrible for branding. When it comes to 404 pages, the page itself should contain all the necessary elements for your customers to continue a conversation with you. In fact, the page layout and design should reflect your brand guidelines as well as carry enough information for your customer to take the next action. Your role as a website owner is to make the life of your customer easier by giving them available options displayed readily in front of them. This is strongly applicable when it comes to 404 pages. Let’s discuss how it affects your Search Engine Optimization. One of the biggest factors in ranking your site based on a multitude of factors is to ensure that you have a low bounce rate and some measurable interaction on your website. This factor does not account for any specific pages or actions, but rather, based on a combined overall site performance, user experience and of course, the amount of actions a user has taken. Another important element of a good 404 page when it comes to SEO, is to have a “search” box on your 404. It’s important that we are able to direct traffic throughout the rest of the site. Having a search feature allows the user to give it a second try, get engaged again, and finally, find the appropriate page/post based on the relevant results that they are searching for. It’s important to remember that when other websites are referencing a link to your site, that it contain the relevant “anchor texts” or keywords that match the contents of that page that the customer will land on. The focus should always be on relevance. The color, feel and style is consistent throughout the entire website, which includes the 404 page. But I find it a bit corny and not helpful at all. As a t shirt company, they’ve kept their brand consistent by displaying a catalogue of different designs and unique shirts that the user can look through. This is an excellent example of a properly used 404 page. Airbnb did a good job of putting together the page. It shows a person dropping the ice cream and demonstrates that sometimes, hosts come back to their place and find their homes a bit messy. Not only does this portray brand consistency but has connected the elements of the experience as well for customers who used AirBnB’s services. By keeping your color scheme and brand consistent throughout – the website users feel more at ease and it provides them with the impression that you’re at a professional standard. This is huge for branding. The customer was already visualizing and anticipating a specific outcome – which will obviously be affected when they land on an error page. B -They can actually stay on the error page and thanks to the brilliant design, proper format, calls to actions, they may choose an appropriate action which will then further the conversation. It’s a question of understanding on how to lead the conversation from an error page into a properly designed funnel that gets the customer curious and into your content once again. Error pages don’t have to be overly complicated, in fact, they can be as simple as putting up two unique call to actions which lead them back to your main page or furthers the discussion by introducing to them, something about your website that they would have otherwise missed. As discussed before, a “search box” can actually be quite useful in those situations. Be sure to include a navigation menu – get creative! Is a navigation menu important? Do users actually click on them – after landing on a 404 page? These are both important questions. The idea of including a navigation menu on your 404 error page helps users explore options or alternatives to what is currently being displayed. By having a selection to choose from, they are more likely to click on any of the navigation links. Sometimes, the menu can be in the form of a picture or large buttons that effectively act the same as a navigation would. This means that when users click on those pictures or buttons, they would be led to the same pages as those included in the primary navigation menu. Often, you may also want to consider creating a whole new custom menu just for those 404 error pages. This may include links to the most relevant pages on your website based on previous statistics to even the different products/services that you offer that are customer’s favorites. Whatever you choose, it’s important that the navigation menu consist of at most 3 to 4 items. You want to help make the customer decision making process easy. Even if that means giving them fewer options to choose in the menu, in contrast to bombarding them with dozens of links. Less is more. That is the golden rule when it comes to call to actions. Especially when it comes to having links and menu items on your 404 error page. Also, don’t forget to keep your brand consistency! Often, website owners just leave the 404 error page with its original text. Throughout this session, we discussed the many different ways to customize it and how to make sure that it ensures a smooth transition for your user. One of the most important things is to acknowledge what happened and to display it through proper context. This is because your customer was looking for something and they did not land on a proper page. You can obviously display the message with your own twist. The main goal should always turn adversity into an opportunity. Always think of the 404 page as a continuation of a conversation instead of it being an issue or a problem. Once again you understand the idea and logic behind a properly formatted 404 error page, there are literally hundreds of ideas that you can implement to improve the look and feel of that page. Another important point is to guide the visitor to the right direction. Using emotional logic and a proper format, you want to tell the customer on what to do. This can be done in many different ways as discussed. And, finally – don’t be shy to ask for help! Often, customers land on an error page due to a broken link or even a mistype URL. You shouldn’t be shy of asking the visitor to submit an error report. Make it easy for them and for yourself at the same time. It’s important that the report contain the URL of that specific page so that you can properly analyze it and correct it. This shows a certain level of initiative from your side to the visitor but also helps you build a stronger web presence overall. So far – we’ve discussed the many different elements of a well formatted 404 Error Page. If you are comfortable updating the 404 Error page manually then you can edit the 404.php file in your WordPress theme files or use a plugin to edit the look and feel of your 404 Error page. 404 Error Page by Seedprod. To create 404 page alerts in Google Analytics after it reaches a certain percentage follow the steps below in the image attached. Go to Google Analytics → Your Website → Customization → Custom Alerts → Manage Custom Alerts → New Alert and follow the steps below. 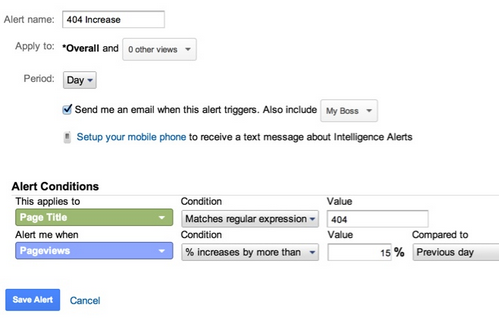 You can find a detailed guide to create custom alerts in this link. You can find a detailed guide on creating goals and how to analyze the URLs in the link here. Once you find the URLs that lead to the 404 page make sure to redirect them to an appropriate page using a 301 redirect plugin. Fix the broken links in your website regularly. Run a test every so often with a broken link checker plugin and fix them. 404 pages are as important as your content. Make sure you always optimize the 404 page for every site. 404 page should follow the same brand guideline as the other pages of your website. Make the 404 Error page very helpful so that the website visitor can continue his/her user journey on the site. Create meaningful calls to actions on your 404 Error page. Use Google analytics to monitor your 404 Error page, once you find the URLs that are causing the 404 Error page, redirect the users to the homepage or appropriate page. 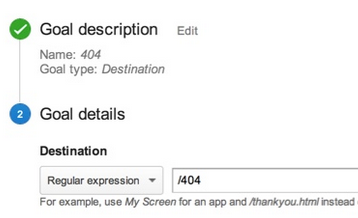 There are endless possibilities to monitor your 404 pages with Google Analytics and Tag Manager. I took a look at your tool and its really great, thank you for sharing.